In every man’s life, there are moments when, as it were, he feels suffocated, perspired and grasping for air, in a closed room. He shouts for free air, light and breeze, but he neither unburdens his heaviest garments, nor opens the windows, nor runs to the veranda. He is bound up with so many ropes, and is so much afraid even to talk about them to others, as also of the public ridicule and censure – ropes of hope, fears, infatuations, desires, ambitions, vices and weaknesses. The greatest reason for the same embarrassment is that he is not prepared to forego anything and pay the price. He is not for a substitution, but addition. He has not realized that no “bhoga” (enjoyment) can be had without “tyaga” (relinquishment).He wants to be nearest East and nearest West as well. He is not prepared to suffer or sacrifice the least, for a new attainment. He wants to grasp new things, without loosening his grip over the already possessed things. He wastes his whole life, in experimenting, in relying too much on his intellect and on outside assistance, and his tact of manipulations. He is for snatching what he is legitimately denied, under the Laws of Nature, Truth and Justice. The Founder often speaks about,” Having the maximum energy , maximum leisure, maximum space and maximum lightness in the brain and in the heart. Have the maximum conversation, about every pleasure having its reaction of pain and exhaustion or tiresomeness “. Your paying off your debts on one side, but incurring new debts of a different nature on the other, takes you nowhere. First plug up the hole, from which water is getting into your boat, and then start the work of removing the already collected waters. First divide your mind two ways .Regarding not incurring additional liabilities; you must be cent per cent active. No more sins, no more vices; no more degenerations. Don’t think even of your good acts and merits. That attachment to the meritorious actions of yours , will again entangle you. The Founder’s patent example is this. Suppose there is philanthropic, good hearted valiant man of brave fighting class, but somehow having a steeling habit. If he sees any beautiful and rich treasure, say, in a king’s palace, he cannot remain without a cleverly managed successful stealing night raid. He has started in the Sadhana of controlling his bad habit. A fire breaks out in the city; he saves the lives of so many. He has come to believe as suggested above. “Don’t be licking your lips for the merits. Forego them.” He runs away, having done most the life saving meritorious work, without letting anyone who he is. The king of a palace is so very pleased with the bravery of the unknown philanthropic man .He offers a tempting prize. Do you think he would go to the tresureful palace to take his prize? No; no; with great difficulty. He has improved his thieving habits. Even if someone said to the king, it was this man, would he admit that? No. 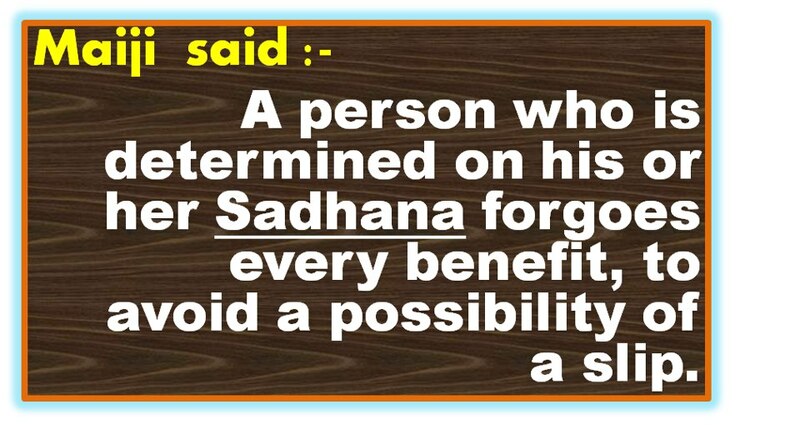 A man who is determined on his Sadhana foregoes every benefit, to avoid a possible of a slip. The Founder says,” If you are avaricious of getting the fruit of your merit, take my word, you will again be entangled. After kingship as the reward of the merits , comes the hell. After heaven, again one returns to the same rotten human world. Yoga योग is the union of individual soul with the Supreme Soul which results by a process after having controlled all senses with mind. Yoga results in being freed from the attachment from pain. Yoga is the restraint of mental modifications and mainly of four varieties – The Raja Yoga राजयोग , Hatha Yoga हठयोग , Mantra Yoga मन्त्रयोग and Laya Yoga लययोग . The above is the popular interpretation of Yoga. Taking Yoga as union, it is the union of the enjoyer, the bestower of the enjoyment and the object of enjoyment. In a word the Bestower of enjoyment is the Mother, the enjoyer is the devotee and the enjoyed is the universe in the first instance and later She Herself. There is a stage when both are enjoyers of each other. During the last stages there is the unification of all these three as one. Next two remaining unified and finally one alone remains. The highest form of Mother as Infinite Source of the essence of Sattwikness सात्विक alone is the bestower of enjoyment and may be called योगदा Yogadaa. The next form with greater portion of Rajas रजस is the enjoyer, the devotee. Here She may be called Yogini योगिनी . And the third containing predominating portion of immovability and material nature is that of the universe, In this She may be called Yogyaa योग्या. 656) Yogaanadaa योगानंदा – The bliss of union. We have referred to souls that take to approaching Her by knowledge. Yoga, devotion and Karma by which last, what is meant is remaining in the world with righteousness and practice of love and service , with Faith in Her and self-surrender to Her, with discharging of one’s duties without the desire of fruit or the egotism of ownership or authorship. One question crops up here, which is so often is used as an argument by the discouraging opponents. ” Does God come to fill in your bags of corn ? Is not God’s subject good only for talking during leisure hours when nothing else is to be done ? If you are after God , is not even maintenance impossible ? This word states that what has been often promised. “She bears the burden of those who try to follow Her path either as Jnanins ज्ञानी , Bhaktas भक्त , Yogis योगी or Karma Nishthas कर्मनिष्ठ . Desire is Her heart, wisdom Her head, action is Her feet. Thus Her body consists of three energies, Brahmaa, Vishnu and Mahesha are the Treasure Houses of the energies of desire or volition, cognition or wisdom and action. Of these energies the preceding one is the cause of succeeding. Mother is the bestower of the energy of desire when Brahmaa, wishes to create. She bestows the energy of knowledge on Vishnu when She reminds him saying “Let this be done thus “. 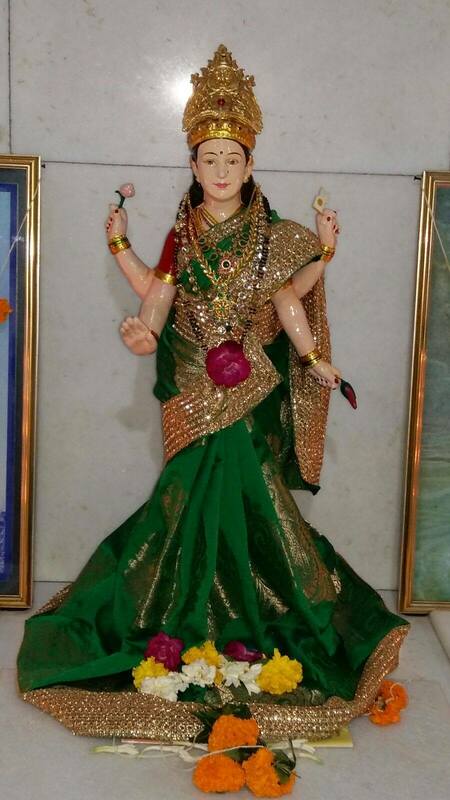 She is the bestower of the energy of action when Shiva wishes to wind up the universe for regeneration. One fundamental energy is transmuted into these three energies which are again transmutable from one form to another. The desire energy is however the nearest to the original energy, just as it is the energy of the tree-life which is creative of fruit, stem and leaf; but the fruit is much nearer the seed than the leaf and the stem.Desire is mother , knowledge is son and action is the daughter. Desire is the individualiser, knowledge is the illuminator and action is the mover towards the fulfilment of desire with means supplied by knowledge. it is by these three energies that the working of the universe and the individual is governed and conducted. It is the desire of ” I may continue to be ” ” I may be much ” ” I may be many ” which is the root cause of the working of universe and the individual. The first desire is responsible for self-centralization, the second for amassing wealth and the third for being attached to woman. It is therefore why wine, ( as life-buoyancy-giver ) wealth and woman have maddened the universe, in some form or another. A man is nothing psychologically , but a bundle of his desires, as the goal and end. When the means of knowledge and action, he is exerting his best to reach the goal. viz., the fulfilment of those desires. His desires determine his pleasures and pains, joys and sorrows, happiness and misery. Emotions follow those desires; character and behaviour is cast in the moulds of his desires. He tries to gather and master that knowledge alone , which is in rhyme with his desires, which would serve his desires. Desire is the Supreme Queen whose minister is knowledge and who reflects herself in the child of action. Desire is mother, and both son and daughter follow her. In the worldly Physical Process mother sacrifices herself fully for the father, and the child is an outcome of their intermingled nature. Mother is the supporter of all. Aadhaara आधार means support and Dhaaraa धारा means gradations and laws. She establishes grades, different diversities, and establishes government, although in the end , it is Mother Herself who is perceived in all things , permanent or impermanent, gross , subtle or more subtle, embodied or disembodied, one or many and everywhere. The peculiarity of Mother’s path is that once you have enrolled yourself you may from time to time get tired, disheartened and leave of exertions and return to lethargy or natural slow evolutionary progress and to the laissez faire policy but She would not leave you. She will make you get up and She will not leave you till you have done your evolutionary work. She will drag you and drive you whether you will or not till you finally reach your goal. This reminds me of a funny story about Maayaa माया. ” Kambaliku chhoda do कंबली ( कमलीको ) को छोड दो ” = ” Leave off and let go the blanket “. The fact was that what looked like the black blanket was a black she-bear. Such is Maayaa, such is woman and such is Mother. The wisest man’s wisdom lies in securing their Grace and saving themselves. What is man’s most tempestuous and rebellious nature before Mother’s Grace ! Obligations over obligations, miracles after miracles, made the wolf to be the lamb. Marriage got settled, money for marriage came forth, earning avenue opened up, enemies became friends. After only a fortnight, Mr. Desai who is a very humorous man came to me and very laughingly told me ,” I came to scoff, but your Mother has caught me from the neck , lifted me up and made me walk on the thread line She laid out”. I answered him laughingly ” Kamali nahi chhodegi “. कमली नही छोडेगी । “The blanket will not leave you “. Kamali कमली is also the diminutive name of Kamalaa कमला , one of the names of Mother. Shishtaas शिष्ट are educated men who can understand and the working, who can decide further course for themselves with help and advice of Guru and the Grace of Mother, and who can introspect and watch the whole progressive procedure. Shishta शिष्ट means disciplined and righteous. Shishtas are those who always perfectly control their limbs, eyes, speech,whole body, mind, desires, thoughts, and actions.Those who are desirous of achieving and maintaining this control, worship and propitiate Her. She is known or seen only by Her own desire , and not by any other cause or compulsion. Sometimes it is said, that the mind turns always fully vanquished, and convinced of the impossibility of comprehending Mother, and again sometimes it is stated that by mind alone, She should be and will be perceived. This contradiction is explained and by adding the qualifying words “Not purified” and “purified by Her Grace”, respectively to the word “mind”. Shakti is Chaitanya itself.Devotees meditate upon that primeval Vidya, which is in the form of Chaitanya of all, and which guides their senses. Thus both Chaitanya चैतन्य and Jada जड , sentient and insentient, is She. An object is and becomes what it is by its own energy. Every object even though inanimate has its own energy and is able to exert a certain influence and produce a certain effect or change. The energy is generally dependent on and borrowed from the Chaitanya Shakti in close proximity. As an instance, a mirror has the power of enhancing the practice of concentration through inanimate. She is insentient Mother as well. 420) Gaayatri गायत्री – Protector of the singer of Her glory. The popular name Gaayatri is that of Mantra consisting of twenty-four syllables. The Gaayatri Mantra of Mother is known to few, and its simple repetition, without the requirement of so many other suffixing and prefixing and distracting rituals, burns all sins to ashes. It is Aadyaayai Paramashvaryai Dheemahi Tannah Maai Prachodayaat . We recognise the Finalmost Mother alone, we meditate on Her, as the supreme Master of the universe and pray that She may pull us to Herself. This is Hindu Mother’s Aaddyaa Gaayatri- For Mai Gaayatri of Universal Mai-ism, please refer to pathanam. While going through this name, one should seriously think how body limits the soul, which is so often led by the requirements of the body. Body has a certain power over the soul. One of the greatest subject of thought, is how to bring about the best and correct understanding about the relation and rhythm, between the body and the soul. Kshetra means the matter or the field and Kshetrajna is the knower thereof, i.e., the soul (jiva). This body is called Kshetra, and on who resides therein is called Kshetrajna. It is explained in Hindu Mythology that Kaali, one of the aspects of Mother as the fighter on battle-field killed a demon, but there after the fire of Her wrath was not appeased. Seeing the consternation of the world , Shiva in order to appease Her anger assumed the form of crying infant. She suckled the child who drank up the fire of anger along with the breast milk. This child which is that incarnation of Shiva, is called Kshetrapaala. Kshetra is also the place where Mother is worshipped. In places where Mother is worshipped, Mother’s invisible devotees remain present. Being so very anxious to maintain the continuance of worship and sacredness of the place, they actually pray to Mother for the continuance of the prayer holding and sacredness of the place and practice. 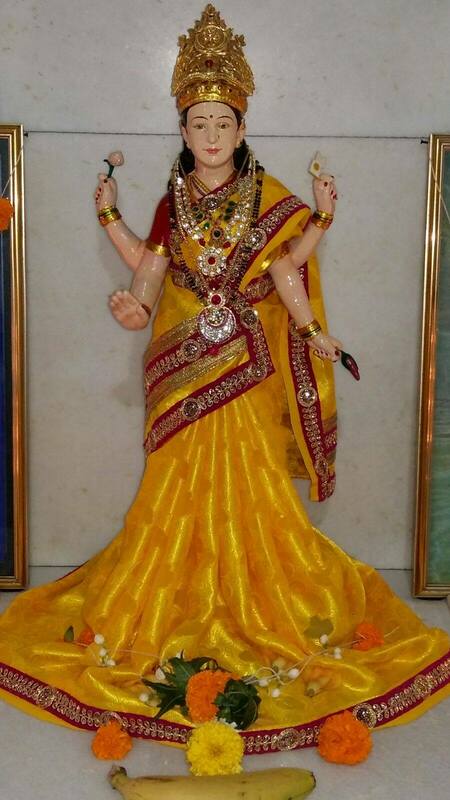 Mother that gives success in all undertakings , to those who propitiate Her on tenth of Bright Fortnight of Aashwin Month, after great propitiation of Her, during the first nine days from 1st to 9th. Vijayaa is the deity and Vijayaa Dashmi (Dasheraa) is the day of Victory for Mother’s devotees.It is a sacred festival day for Hindus and is connected with success of Rama after Mother worship and that of Paandavas of Mahaabhaarat and so on. All Hindu kings observe the day with great splendour and display, and on the said festival day, people worship their weapons, and means of power and maintenance, swords, horses, even motor cars etc. The day falls somewhere near about October. She resides as speech in the mouth of Her devotees, and She is the origin of all words and their phonetic powers. Hrim means shame and kaari, doer. One who makes you feel ashamed, of what you are and creates humility. The Maai Beej Mantra is ” Aim Hrim Klim Sauhoo. ” and in very simple way means as under. 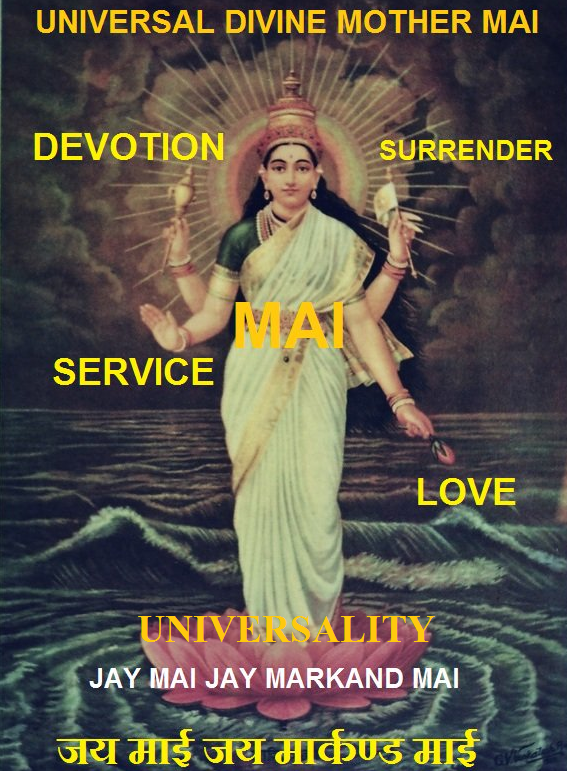 Aim is love and devotion to Mother. Hrim means Her lifting Her devotees to a stage, when he begins to feel ashamed of his ingratitude to Mother, of his ignorance, of his relation and treatment to others, of his views and of his crimes, sins, vices, foibles, incapacities, etc., and further raises him to the still higher plane , where his actions and thoughts are up to his ideal. This Grace of being lifted to that higher plane being there, he has an attractivity, which is represented by Klim. Sauhoo, is the finishing perfecting final Grace, which does the final act of perfecting devotee to the finish on personal appearance and relationship. Aim is Mother. Hrim is Mahaalakshmi, Klim is Mahaakali, and Sauhoo is Mahaadurgaa. By repeating “Aim:, one gets love for and from Mother and disinterested devotion. By “Hrim” he gets all wisdom and knowledge and self-control. By “Klim” he gets attractivity, power of subjugating others to his will and Siddhis and Supernatural powers, etc.”Sauhoo” removes all obstructions, destroy all evils and perfects whatever is imperfect. 302) Hrimati ह्रींमती – Possessor and giver of “Hrim”. 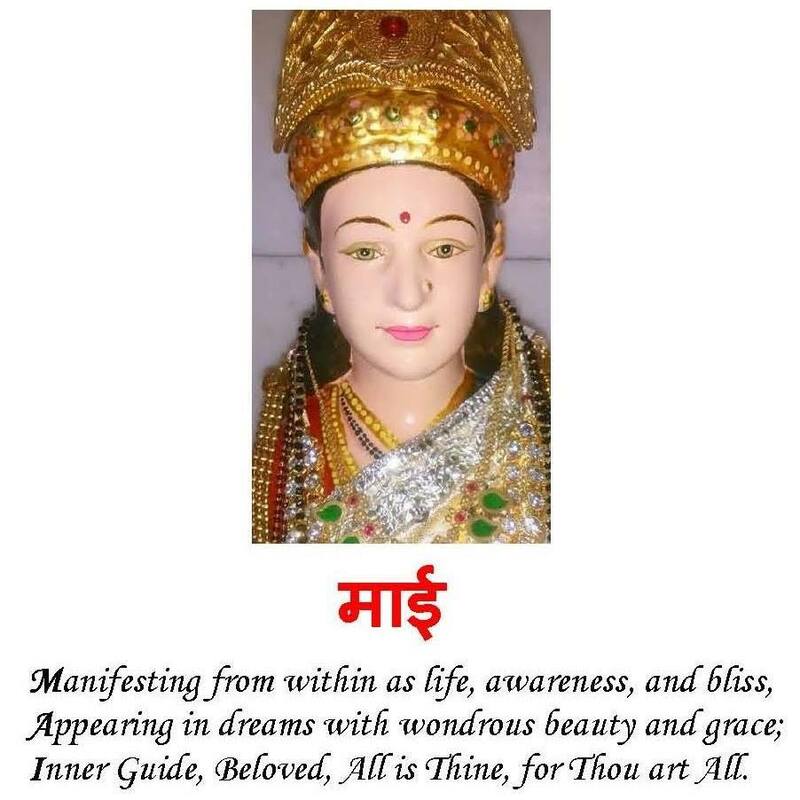 Hridyaa means ‘ She that is in the heart of Her devotees. ‘Hridyaa also means delightful to the heart, there is a delight due to the constant remembrance of Her devotees. Because She has no fear and no hope.Because She is above the influence of anything , and because She is not imperfect. She is not busy with perfecting Herself. Because none and nothing is attractive or repulsive to Her.Scriptural obligations and prohibitions , except those relating to fundamental universal truths, are not indispensable to one , who has received Mother’s Grace. 308) Raajiva-lochanaa राजीवलोचना -With eyes like those of deer.